Los Angeles-based Fol Chen made a perfect opening act for Liars at this packed Sunday night show back in April at Music Hall of Williamsburg. Though Liars’ style may be a bit heavier, both bands play music that treads outside the boundaries of normal song structure and typical rock style (if such a thing exists these days anyway). Little that the band does is obvious, with a theatrical, beat-driven sound that isn’t easily categorized. The set kicked off with the catchy and hypnotic “Red Skies Over Garden City”, my favorite from the band’s debut, John Shade, Your Fortune’s Made. From there, the band played a few songs from their latest record (released this week), Part II: The New December, as well as the unreleased and never-recorded “The Nudibranch Paradox.” Live, the band’s sound has a much sparer, more rock feel that emphasizes the live drums and the vocal harmonies. Although it is a departure from their records to an extent, it is a welcome change, showing that the songs can stand on their own without studio wizardry. We are releasing this recording at this somewhat delayed date at Fol Chen’s request, as they did not want our live recording to “preview” their new songs until they were officially released. Now that their new record is out, please check out Part II: The New December and find out more about this excellent band. I recorded this set from our usual spot in the venue. Other than a few chatterers here and there, the sound is excellent. Thanks to Fol Chen for releasing the recording, and for their help with tracking and song titles. Enjoy! Please note that as the Liars performance was being recorded for a live album that will feature the entire April 18th performance. 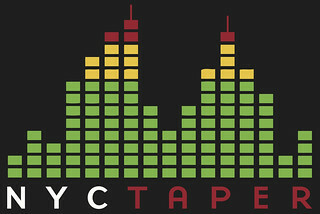 Therefore, although it was recorded, NYCTaper will not be releasing this recording. The live album will be worth the wait once released! If you download this recording from NYCTaper, we expect that you will PLEASE SUPPORT Fol Chen, visit their website, and purchase Part II: The New December and their other records from Asthmatic Kitty here.